Flagstaff Altitudes – Page 52 – A photo blog about mountain biking, skiing, running, weather, astronomy, and more. Although we had a lot of snow in Flagstaff and northern Arizona in December, it’s been completely dry since then and the snow has slowly vanished. We’ve taken advantage of the dry weather and done a lot of trail running in Sedona. It’s always warmer there, of course, because of the lower elevations. But even there they received measurable snow in late December and, as a result, many of the trails are still muddy and some still have patchy snow in the deep shadows. Still, it’s been a great chance to try out some new trails. We’ve been aware of the growing number of non-system trails (i.e., trails that are not part of the Forest Service network) and have been interested in trying some. The Forest Service has also recognized that some of these trails should be brought into the system. 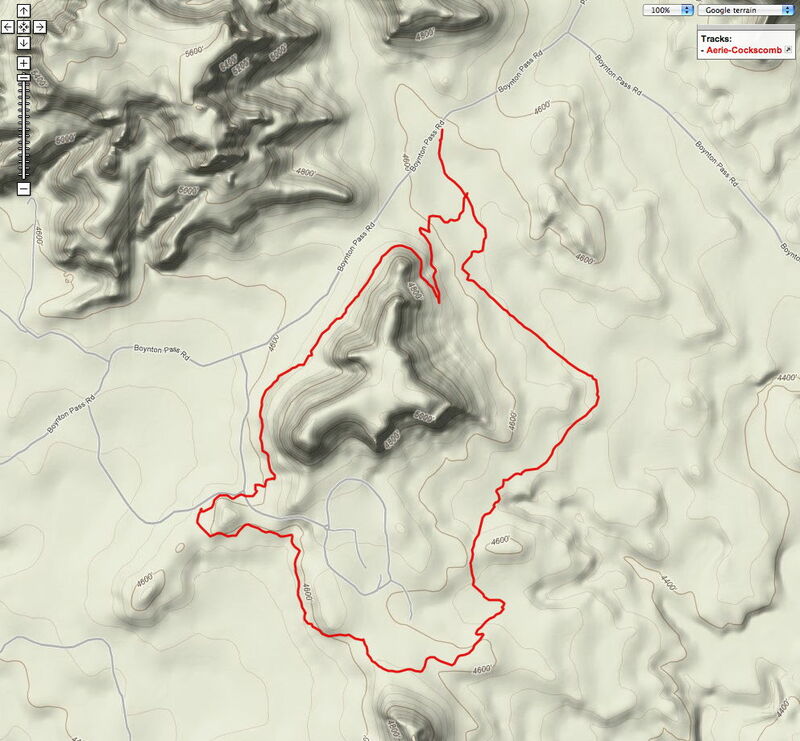 One of these is Aerie Trail which starts from the Boynton Canyon Trailhead and heads in a generally westerly direction, passes by the Fay Canyon Trailhead, then heads towards Doe Mountain. You can connect this trail with Cockscomb and make a nice loop. Although parts of the trail were exceptionally muddy, other sections were dry. These two trails can be combined into a short, ~6 mile loop. Another loop we’ve done a few times is the Munds Wagon–Cow Pies–Overhang Loop. 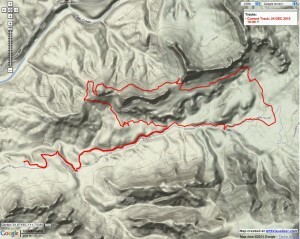 This loop has some amazing views from the top of the saddle and some great running sections on the Overhang section. Keep your eyes open for mountain bikers! So many trails … so little time! Correction (10 March 2011): The USFS document referenced above does not include the Aerie Trail in their list of non-system trails. Yes — it does get this cold in northern Arizona from time to time. Not often, though. This morning (01 January 2011) the temperature fell to -30°F in Bellemont, Arizona, where the National Weather Service office is located. 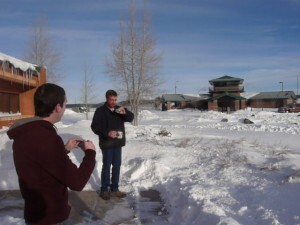 At the Flagstaff airport it reached -19°F and the Grand Canyon National Park airport fell to -28°F. 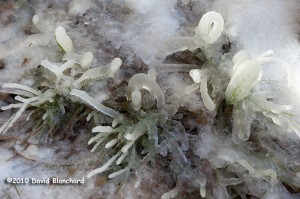 Even colder was the automated site at Greenbase, located between Williams and Parks, which fell to an astounding -38°F. The record for this date in Flagstaff is -21°F (1919) and the coldest temperature ever recorded in Arizona is -40°F at Hawley Lake (07 January 1971). So what can you do when it is that cold outside? Well, you can toss a cup of boiling water in the air to see what happens! Boiling water and frigid air. An interesting combination. By early afternoon, the temperature had risen to 25°F resulting in a range of 55°F in just a few hours! A powerful winter storm moved across Arizona in the last week of the year with substantial snow falling in the high country and even some snow flurries in the desert. In West Fork Oak Creek about 8-12 inches of snow fell in the canyon followed by very cold temperatures. The result was spectacular. Snow was draped across all the trees and even clung to the massive sandstone walls of the canyon. Water dripping down some of the rock walls fell and froze on whatever lay beneath creating some amazing ice art. 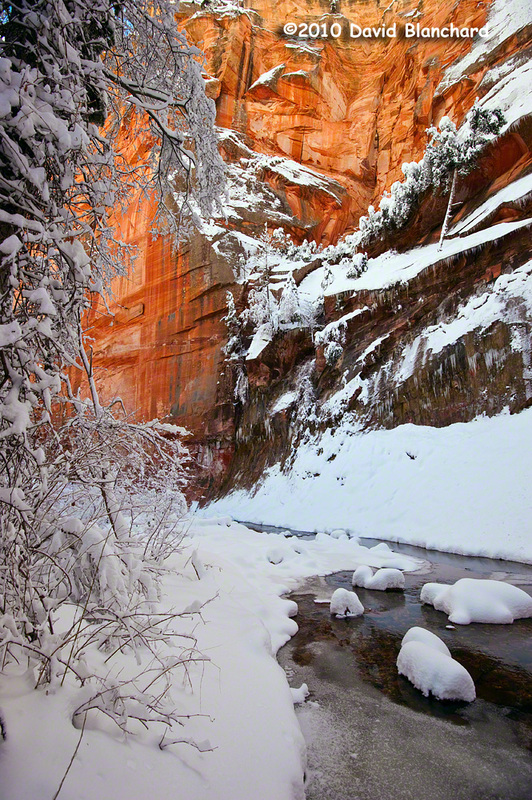 A winter storm brings substantial snow and icy streams to the West Fork Oak Creek. 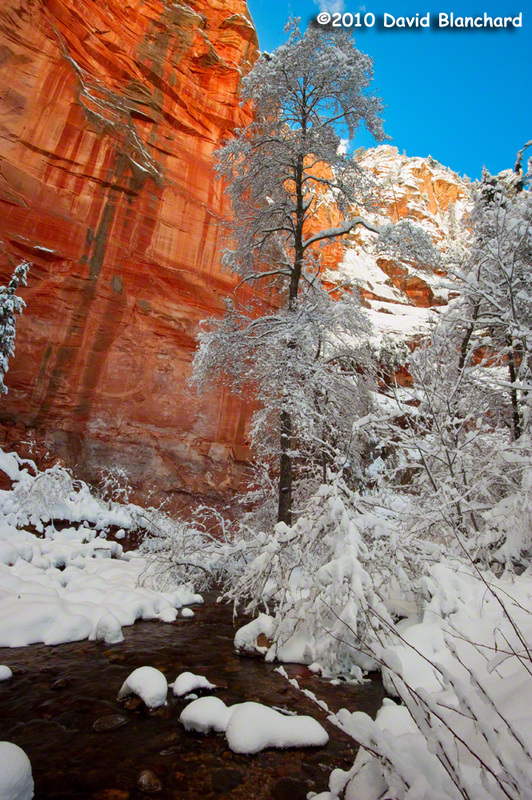 Blue skies, brilliant red sandstone walls, and a fresh cover of snow in West Fork Oak Creek. 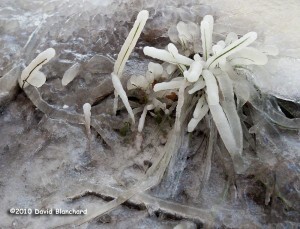 Water dripping down the sandstone walls falls onto grass creating a work of ice art. Frozen blades of grass shimmer in the faint winter sun in West Fork Oak Creek. Not too far south of Flagstaff lies Pumphouse Wash, a beautiful and narrow canyon that cuts through the Kaibab limestone and Coconino sandstone. The canyon drains from the upper elevations of the Mogollon Rim into the headwaters of Oak Creek. Most of the time Pumphouse Wash is dry with occasional pools but it can run very full during the spring snow melt and after heavy summer thunderstorms. Shortly after a light snowfall in late November I took a walk up the wash hoping for some interesting photographic possibilities with snow and ice. I wasn’t disappointed. The first image shows a small pothole scoured by the erosive actions of the occasional flood waters. 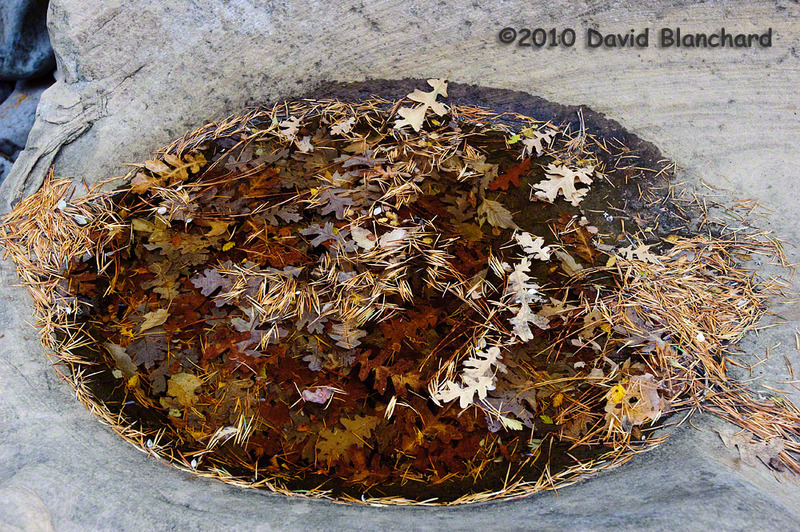 It was filled nearly to the brim with rain and snow melt, perfectly blended with leaves and pine needles, and then frozen in time. A mixture of rain and snow melt with leaves and pine needles all frozen in time. Elsewhere in the canyon a sycamore tree had shed its leaves among the boulders of the wash and upon these leaves some snow was still in place. 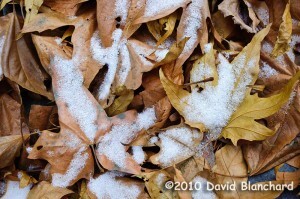 Snow atop fallen sycamore leaves in Pumphouse Wash. Although it was a sunny day in northern Arizona very little of that sun was able to penetrate into the confined narrows of Pumphouse Wash. And I had the canyon to myself that day. 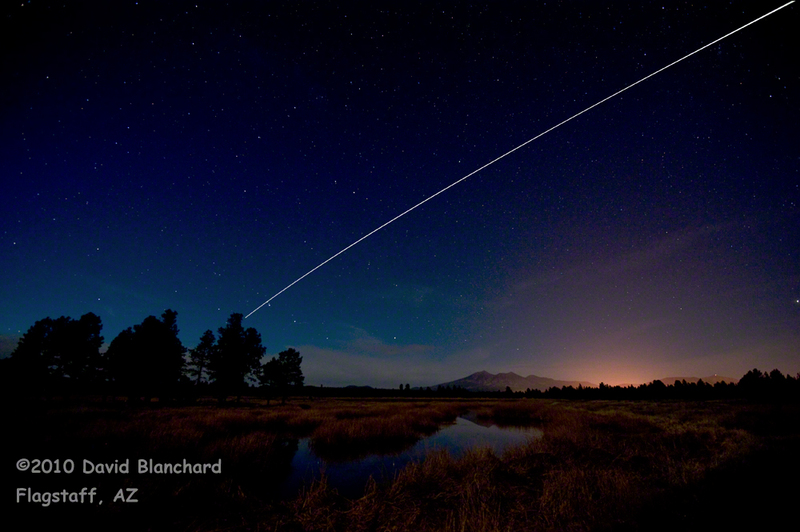 A few weeks ago we had a couple of nights in which the International Space Station (ISS) made some evening twilight transits that were visible across northern Arizona. 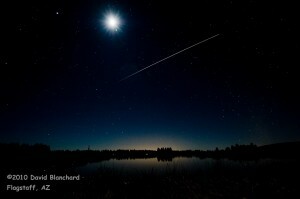 The first night the ISS transited from the northwest across the sky to the east. As it swung across the evening sky it passed near Mizar in Ursa Major then near Polaris in Ursa Minor. The following night it traveled from west to southeast and passed near the Moon and Jupiter before it entered into the Earth’s shadow. International Space Station transiting the skies across northern Arizona. Both of these final images are composites. Each was shot with a 16mm ultra-wide angle lens at f/4.0, ISO 800, and 10s exposure. For the photograph above, 16 images were composited. For the photograph below, seven images were used. In Photoshop, images are assembled as layers then blended using Lighten mode. This allows the streak of light from the ISS to show through all layers. The advantage to this method — compared to a single image of longer duration — is that the sky does not become overexposed. Instead the result is a dark background upon which the ISS flies. Both images were taken at the Kachina Wetlands located a few miles to the south of Flagstaff, Arizona. This location provides wide open skies for viewing objects low on the horizon and offers ponds of water that produce wonderful reflections of the stars.